View south from High St. steps along Hickson Road at Union Co. #5 dock showing restriction of wharf frontage by high cliffs paralleling Darling Harbor. Warehouses Etc. on upland. Sometimes photos of an area show a glimpse into a past long gone, and the photo above, taken by an unknown photographer, circa 1936, is one such image. 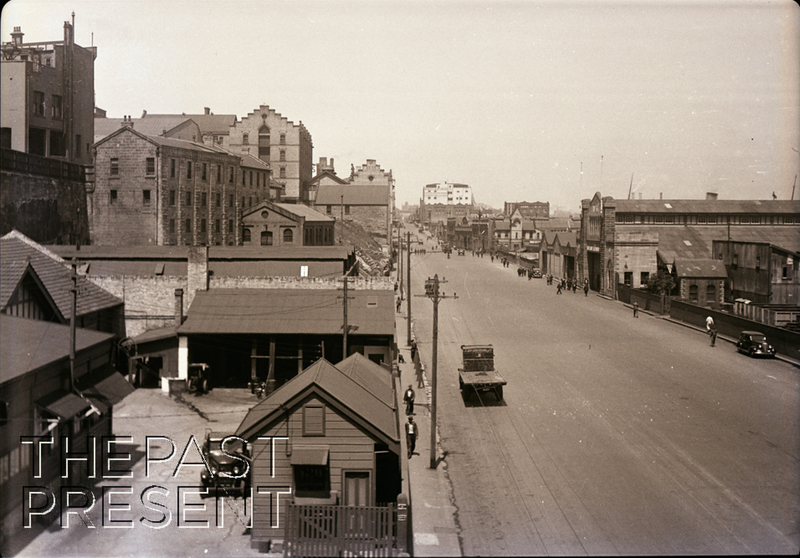 Although it is a view which remains remarkably similar today, Walsh Bay and Millers Point is a very different place now to the working maritime area which is glimpsed through this image. Before the 1830s, Millers Point was isolated and reasonably deserted, with few people settling in the area. Three windmills, operated by John Leighton (known as Jack The Miller, which inspired the name of the area itself) and a military hospital were built in the area, but only six or so houses were to be found in Millers Point in the 1820s. However, by the 1820s Sydney Cove itself was becoming crowded and Dawes Point was already being adapted to the maritime industry. The deep waters of Millers Point, adjacent to Dawes Point, became the focus of a thriving, if malodorous, whaling and sealing industry and by the 1840s workers cottages and even the occasional fine house belonging to wharf owners were beginning to appear. It was in the 1850s that Millers Point became a hub for maritime activity. Almost all workers in the area during this time were connected with the wharves or the local infrastructure which supported them (including hotels, boarding houses and pubs). By 1861 there were even six large warehouses built on the waterfront. The Millers Point of this era though would have looked very different even to that pictured in the photo above. Come back next week when the Past Present will share another beautiful photograph of the area, and the story of how and why the area underwent such dramatic changes. This entry was posted in New South Wales, Sydney and tagged 1930s, black and white, buildings, domestic, industry, photographic collection, streets, sydney, sydney harbour, transport.